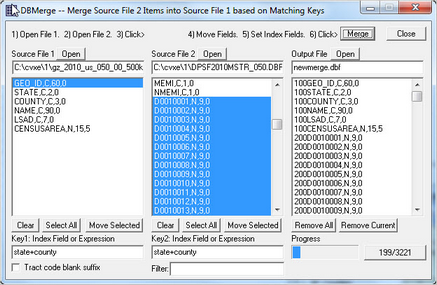 Database>dBMerge enables merging dBase files based on common key fields. 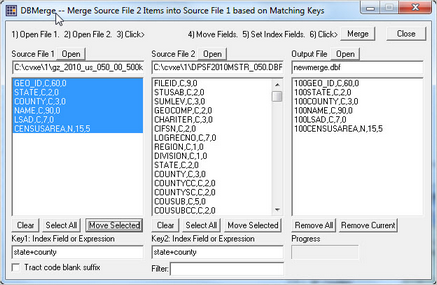 This section reviews use of the dBMerge operation to integrate subject matter data into a shapefile. The dBase file gz_2010_us_050_00_500k.dbf described in the dBCreate section contains no demographic subject matter data. While a map can be made of the U.S. by county using the shapefile gz_2010_us_050_00_500k.shp, thematic pattern maps cannot be created before first integrating data with the shapefile. This section illustrates steps to integrate demographic subject matter data from the U.S. by county Census 2010 Demographic Profile Summary File (DPSF) into the gz_2010_us_050_00_500k.dbf. Verify the files c:\cvxe\1\GZ_2010_US_050_00_500K_copy.DBF and c:\cvxe\1\dpsf2010mstr_050.dbf exist on your computer. The dBMerge form now appears as shown below. 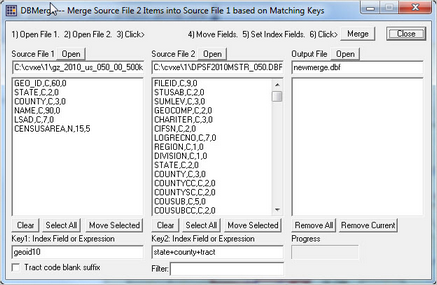 Change the Key1 and Key2 files to state+county as shown below. 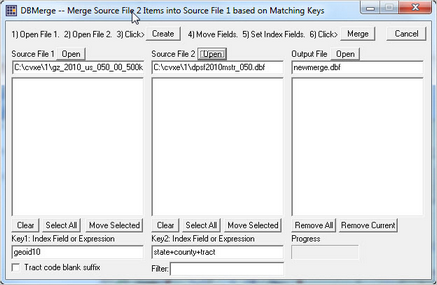 Select the 6 fields in Source File 1 and click Move Selected under Source File 1. Select fields in Source File 2 starting at D0010001 though last field and click Move Selected under Source File 2. Click Merge button and merge starts. Wait until merge complete and allow overwrite.